One of a series of posters/flyers for a concert series in Saarbrücken, Germany, 2000/2001. The print form is identical for posters and flyers, only the material is changed: posters are printed on 100 gsm paper, flyers on cardboard; the cardboard sheets are then cut down to make 12 flyers per sheet. Dimensions: 400 x 600 mm (posters), 180 x 90 mm (flyers). 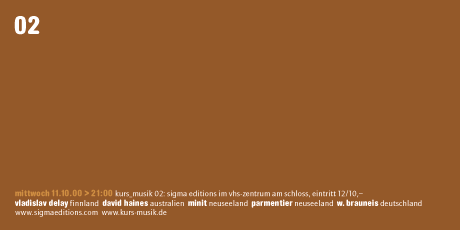 Published by VHS Saarbrücken, 2000.